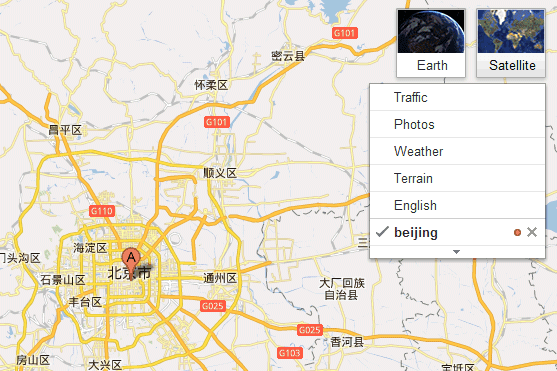 Google Maps has a new layer that "switches between the labels in the local language and transliterated text". It's enabled by default, but you can disable it by mousing over the layer box and unchecking "English". Until now, both versions were displayed and the map looked cluttered. It doesn't do that for Welsh. Take for instance "Lake Vyrnwy" which you can locate on the map via direct search but is shown only as "Llyn Efyrnwy"
It's a great start, but here in China only extends as far as the map label layer. 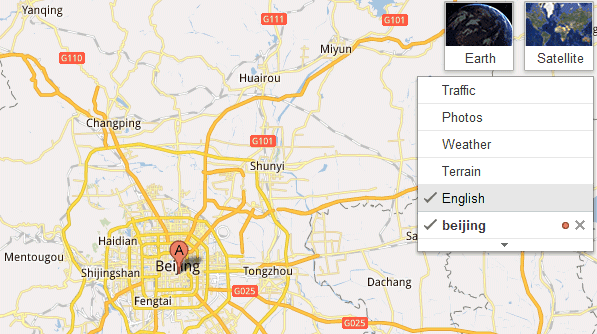 Road names and the like are still in both languages, and Google directions only display roads in the Chinese characters. Very nice update. I see on the comments above there is more work / improvement to do. @Anonymous: That's not Welsh, that's Elvish! This "feature" is pathetic. I don't know Korean, and hence I can't look at a map of Seoul, because the entire map is filled with names in Korean language. I want to see names in English, not in Korean, and there is no way I can do it. I can disable English but I can't disable Korean text on the map.